West France is a constituency of the European Parliament. It currently elects 10 MEPs. 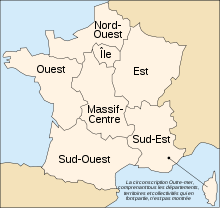 It includes the French regions of Brittany, Pays de la Loire, and the former region Poitou-Charentes (now part of region Nouvelle-Aquitaine). Brackets indicate the number of votes per seat won.